With further impending budget cuts by Kirklees Council it seems inevitable that Tolson Memorial Museum at Ravensknowle will be effected. Even if there are no serious cuts leading to reduced opening hours – or worse – the withholding of resources will have a serious impact on the fabric of the building itself. The roof, which suffered a lead theft a decade or so ago, is badly in state of repair…and any building is only as good as its’ roof. The attic storey is home to one of the most important collections of Entomological specimens, particularly Lepidoptera, in the country. These insects, some over 130 years old are extremely vulnerable to atmospheric conditions. As my contribution to the campaign to safeguard Tolson Museum’s future I have decided to publish on-line the chapter from my biography of Seth Lister Mosley, describing his role as the museum’s first curator and the establishment of the museum from 1920-1925. This book ‘Harmless Oddity?’ is still a work in progress and the present chapter is in a form that lacks all the footnotes and references. However, the sources are usually evident from the text. I hope that this story of devotion and dedication will inspire people to value the museum as a vital part of our local heritage and a jewel in the cultural history of the town and district. This is Chapter 7 of the proposed book so a brief introduction has been added to set the scene. Other papers on local naturalists which provide more historical context can also be found on the website. Seth Lister Mosley’s association with the proposed Tolson Memorial Museum at Ravensknowle began as it continued – with Seth at loggerheads with the Museum Committee. Some of this was rooted in a long battle with the Corporation to establish a local museum and frustration at their lack of support when he was curator at the Technical College Museum. How far it was a result of personal friction with Dr Thomas William Woodhead, a long time colleague in the Huddersfield Naturalist’s Society, and now head of the biology department at the Technical College, is not clear. What is certain is that Seth’s strong opinions and missionary zeal undoubtedly got people’s backs-up. He was determined to plough is own furrow, but no one could deny the contribution he had made to the study of natural history and to the museum movement. Seth was also both proud and sensitive to the fact that that he was self-educated and had little formal education. Almost an archetype of the Victorian ideal of self improvement he was frugal, a temperance advocate and driven by the urge to pass on his learning to others, which he did in a prolific flood of pamphlets, journals, serialised books, newspaper articles, drawings, lectures and sermons. He was an expert communicator and populariser – but as such his output lacked the precision, depth and rigour demanded by more academically trained scientific minds. His conversion from secularism to a non-sectarian, almost pantheistic, version of Christianity in the early 1890s, led him to what others saw as fads and mysticism. His reverence for life extended from vegetarianism to a condemnation of killing creatures for any but the most strongly justifiable scientific reasons. This placed him at odds with some naturalists and museum committees, who still saw the accumulation of collections of specimens as the ideal. His strongly held moralistic opinions probably made him seem ‘holier than thou’ to some people. To add insult to injury the copy arrived with a covering letter, ‘You will be glad to be informed…’ Seth, who was always at pains to point out his life-long association with museums, was stung to retort, ‘I have been informing myself on museum matters for the last sixty years and have developed a scheme of my own which for years I have been anxious to lay before the proper authorities, but I have hitherto been unable to do so…’ He listed some of the famous museums he had done work for and threw all his cards, including his ace, onto the table, ‘I am not only willing but anxious to work in co-operation with anyone who is competently interested in a town museum, but I can not be easily expected to be dictated to or accept a scheme in its entirety in the construction of which I have had no part and which entirely overlooks the main point’. The main point being there was already a local museum in existence which held 2,500 of 3,000 local species, ‘mostly collected by myself, in my own time and at my own expense over the last fifty years, or specimens which have been given to me, or through me, to the museum.’ including a large part of his Beaumont Park Museum collection, which comprised over half of the specimens in the museum and still belonged to him. He complained that as Technical College curator he had not been able to continue the real work begun at his museum. He followed this undisguised threat with a series of anecdotes underlining the achievements and support he had won by his popular style of teaching. His own proposals for a museum were set out in his December column, where he suggested that where possible different species should be represented by drawings, of which he had copied over 20,000 for this purpose from museum specimens or figures in books. This was his intention, he said, ever since he started his own museum 50 years before in his house separated from Ravensknowle only by the park wall. Whether this was merely a caveat, or a serious attempt to scupper Mosley’s appointment is not apparent, but either way it cut to the quick on all that Seth held dear – his vast knowledge of the natural world, his journalism and his collections. It also confirms that Seth was not entirely unjustified in believing that he had been deliberately kept in the dark about the museum scheme. The condescending reference to the standard of writing suitable for ‘the newspaper’ is an obvious swipe at his Examiner column and no doubt the author of the memo was irritated by the way he used it to publicise his demands. Seth continued to use this weapon and it remained a source of friction with the Museum Committee – or at least some of its members. 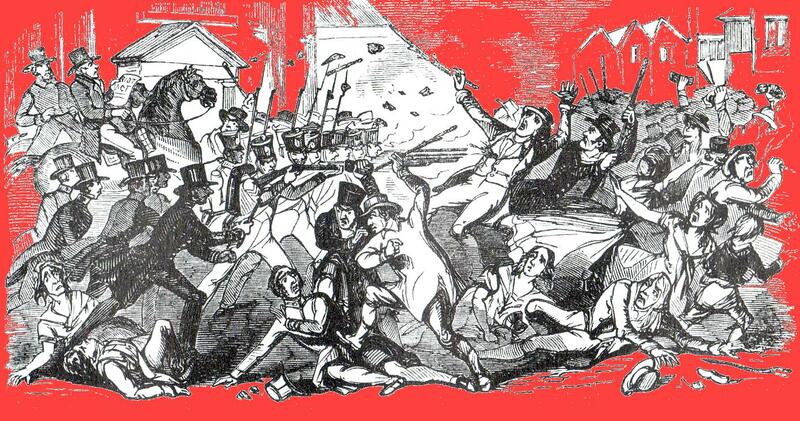 Despite this attack, the Sub-Committee confirmed Seth’s appointment on the 14 April at salary agreed at £150 per annum. His son Charles was appointed as assistant curator on £200 per annum, the apparent discrepancy due to accommodation at the Museum being part of Seth’s agreement. However, he was not totally satisfied with the deal and the following Saturday, 17 April, referring for the first time in his column to what had been going on, he expressed some misgivings. He had obviously been warned that he was not to pursue any of his ‘missionary work’ in his capacity as curator. The following week he followed this up this with a complaint about proposed constraints on his research work. Under the heading ‘Provincial Museums’ he described his work for Keighley Museum where he had been part time curator from 1901 to 1910 and had ‘a perfectly free hand’ to carry out investigations, for example in Upper Airedale, with expenses paid ‘without question’. The use of his column to air grievances in this way must have infuriated his opponents on the Committee. 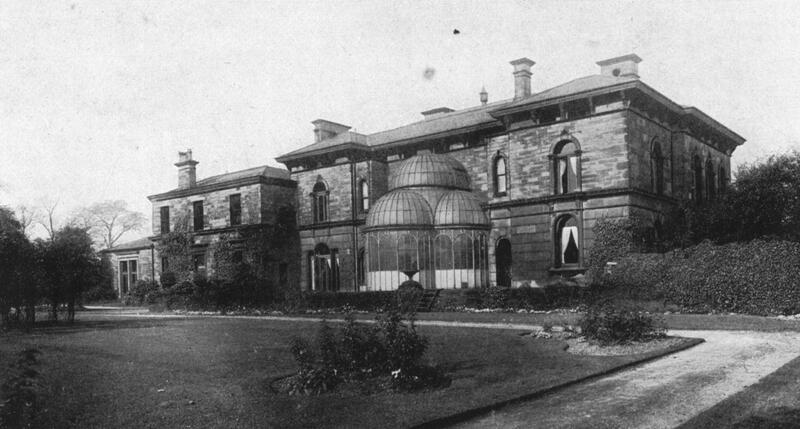 One of his proposals was ruled out at their meeting on 28 April, when it was resolved ‘That the committee regret that the offer of Mr Mosley to sell certain natural history collections can not be entertained.’ Whether this refers to his specimens from the Beaumont Park collection is not clear but another proposal, that the Corporation buy the printing plant run by Charles was thrown out on 17 May when councillors reported that it was ‘too large for the needs of the museum’. If this was the case then Charles must have done a lot of commercial printing as well as his work for his fathers and his own publications. Despite his reservations, Seth had in fact had already begun detailed work for the new museum. On 15 May he announced he was adding more ‘harmful insects’ to the collection begun at Beaumont Park and, on 26 June, requested help from collectors with finding local specimens of insects for the new general insect collection. He was always keen to show that natural history had a practical, useful application and in fact the by-line on his column was ‘Forty Years Agricultural and Horticultural Naturalist’. In July he observed that about 30 different species of birds frequented Ravensknowle Park, including several spotted flycatchers, and the following month he had some nest boxes made. He still used his column to push his own plans and on 28 August stated, ‘I believe it is the intention of the Committee (although I am writing without authority) to make the park as much as possible a bit of real country.’ He was also working on the stuffed birds, setting some up in larger cases with scenic backgrounds. In May he had suggested to the Committee that the exhibitions be of artistic representations but had been told that the public preferred stuffed birds to paintings of them. He pointed out then that stuffed birds had been donated to the Technical College Museum because they were no longer in fashion, the owners didn’t want them and couldn’t sell them. Moreover, no doubt appealing to the Councillors sense of economy, it was very expensive to set them up in a modern way. Mr Johnson Wilkinson, a local member of the Yorkshire Naturalists Union, and head of their Bird Protection Committee was agreed as an advisor. Although the Museum was not yet open to the wider public Seth hoped photographers and artists would begin to use it. Seth’s use of his Examiner column as a platform for his radical views on stuffed birds earned him over a page of ridicule in the ‘Notes and Comments’ section of the Naturalist, the journal of the YNU. Even if the remarks did not emanate from Dr Woodhead, as coeditor of the journal, he must have endorsed them. Perhaps stung by the remark that stuffed animals were ‘but a relic of the hunting spirit we have inherited from our cave dwelling forefathers…’ the Naturalist retorted ‘We believe we remember seeing “stuffed birds” under this writer’s care – and we fancy that he stuffed them. We shall be glad to hear the result of Mr Johnson’s enquiries.’ It also sarcastically criticised his inconsistency about the sacrifice of life in wanting his butterfly and moth collection, deemed unsuitable for the museum, displayed, suggesting that perhaps the Committee was going to represent them by life-size drawings. His appeal for a Cuckoo’s egg from a Dunnock’s nest was cited as an example of his hypocrisy and even an incitement to break the law. But it was his expression of religious views in his column which aroused the most spleen, and an excerpt from one of his attempts at hymn writing was reproduced as the coup de grace, ‘You need but ask the lilies/And the bird up in the air/They will tell you all their joy/Is to trust the Father’s care.’ If not Dr Woodhead, someone meant to do Seth’s reputation serious damage among the Yorkshire naturalists’ establishment. Seth announced on 4 September that he was now curator in residence. All correspondence had to be forwarded to Ravensknowle and visitors seeking information or bringing objects were welcome to call from dawn to dusk. The following week his column sub-title becomes ‘Curator Ravensknowle Museum. Whether merely through pressure of work, or because he had advised to do so, he declared on 1 October that he was giving up his Sunday appointments, which over the years had taken him to around 300 places of worship delivering over 900 sermons. He was reserving his Sundays for ‘spiritual research’. The new post did not, as feared, entirely curtail his jaunts into the countryside since some of the materials for the exhibitions he collected himself – in November returning from a ramble to Storthes Hall Wood with a bag of autumn leaves for the bird cases and a bag of tree fungi for cooking. Facilities included his own private study and he soon began the task of sorting out the large number of sketches he had brought with him. He had 351 volumes including 37 of British Birds, 47 of British insects, 25 of plants, 19 of mammals, 33 geological as well as dozens of drawings of foreign species. His son, Frederick Ormerod Mosley, a plant pathologist and entomologist at University College, Reading, used sketches as an essential part of his teaching and Seth, showing he had not totally dropped the idea, proposed that, where appropriate, the exhibits at Ravensknowle should comprise artwork rather than dead specimens, citing the success he had with this at Keighley. His walk to Storthes Hall was the last for some time. On 13 November Mrs Mosley suffered a stroke which paralysed her left side and affected her speech. The latter recovered in a few days but it took much longer for her to regain use of her limbs. On 27 November he wrote that, because of her illness, he had not been out for three weeks to make any of the observations on nature which he usually appended to his column. (He was unable to leave her on Sundays until the following July). For such an active energetic man the limitations on his movement must have been very frustrating, although he blamed not his wife’s invalidity but the constraints of his conditions at the Museum. ‘Whatever is worth doing is worth doing well and when it falls to my lot to do it my whole soul goes into the work and I like to have the liberty to do my best. At present I have to waste much time getting to and from such places when often walking is the only means, which considerably reduces the time to be spent there in investigation. I know at least one person who occupies a similar position to mine who is not only provided with a motor but also with £100 a year expenses besides his salary’. This outburst was not calculated to win any sympathy for his predicament but he was in no mood to hide the fact that he was feeling trapped and despondent. The following week he was inspired by the star-like reflection of lamp light on the glass door panels of his study to mull introspectively over the ‘Eight Rayed Star’ of his life from birth – through temperance and vegetarianism, marriage and Christianity, to his profession and work at Ravensknowle culminating in Death. His next column must have given further concern for those already perturbed by such lapses into mysticism. Entitled ‘What About Fairies’ he accepted that other people may have seen fairies, including the wife of a late member of staff at the Technical College, and conceded that just because he hadn’t seen any himself that was not proof they didn’t exist. He also advocated silent meditation with nature. The response of most fellow naturalists was probably voiced by Ben Morley, a handloom weaver and entomologist from Skelmanthorpe, who wrote complaining that fairies were not a suitable subject for a natural history column – at least until one had been caught and put in a collection. Unapologetically, Seth reminded his readers that his concern was not merely with collections, but exploring the ‘no-man’s land between science and religion’. However, the same article also showed he was still concentrating on his job, ‘We have at last got a fine building set apart for a museum worthy of a town which has not lagged behind in many other things…What are we going to do to make it what the generous donor desired it should be – a museum thoroughly representative of the district’. He lamented the loss of local collections – James Varley’s eggs had gone to Burton-on-Trent and his insects ‘I believe are now in a cellar under the “care” of a corporate body’, Lister Peace’s large collection of land and freshwater shells had been abandoned in a backyard in the rain and Alfred Beaumont’s Lepidoptera had been bought by a London dealer. ‘Happily’ his birds had remained in the district and were now at Ravensknowle. Seth was determined to track down and acquire for the Museum, any other local specimens. 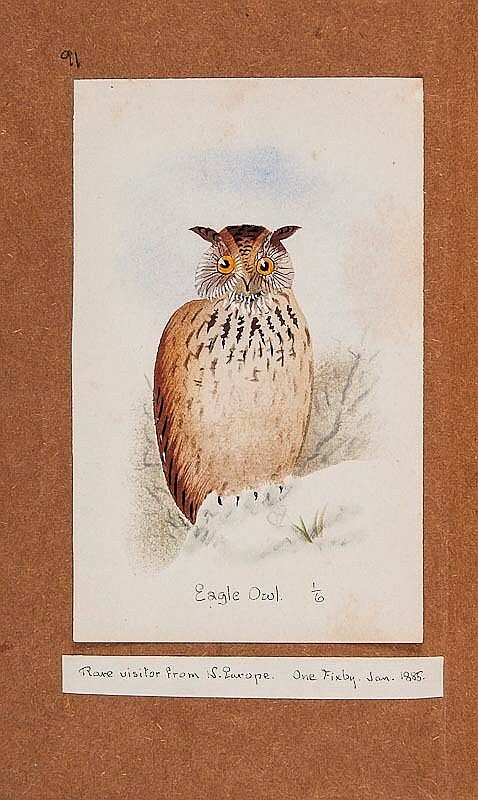 One of his most successful acquisitions, in July 1921, was an Eagle Owl shot in 1885 at Fixby by Joseph Firth. He traced it to the Slip Inn at Longwood and persuaded the landlord to part with it. ‘The Work Crowds Round Me’ – 1921. In May Ravensknowle Park was opened to the public and preparation of the museum was going according to plan. Seth seemed more relaxed, reflecting ‘All my work is pleasure and all my pleasure work. This is the secret of a contented mind and a happy life.’ He still got out and about, if not for his Sunday rambles, and in July, while investigating a wood for poisonous plants which may have killed some pigs, he found a hollow tree which he thought ideal for displaying the owls. It was brought back to the museum. His friend Joe Alsop, always referred to in print by Seth as ‘The Old Scout(er)’, a farmer, naturalist, antiquarian and inventor from Gatehead above Jackson Bridge, also brought him in dried grasses for the displays as well as a wasp nest. Among his visitors in 1921 were Miss Wright and her parents who brought the famous photos of the Cottingly Fairies for his opinion. No doubt charmed by the phenomenon he did not dismiss them out of hand, but nor was he convinced, ‘Without being sceptical , science demands proof before anything can be finally accepted…I would give a good deal to be satisfied they are real. But I want to know why they are not in accordance with the laws of Nature.’ He did not know of any other four limbed vertebrate creature with wings and the depiction of a fairy plucking a flower seemed to reflect too much of a human idea. By Easter, when the Museum was due to open, he hoped to have displays of insect life cycles, showing how they were useful or injurious to crops – a total of about 3,000 specimens in over 600 cases. 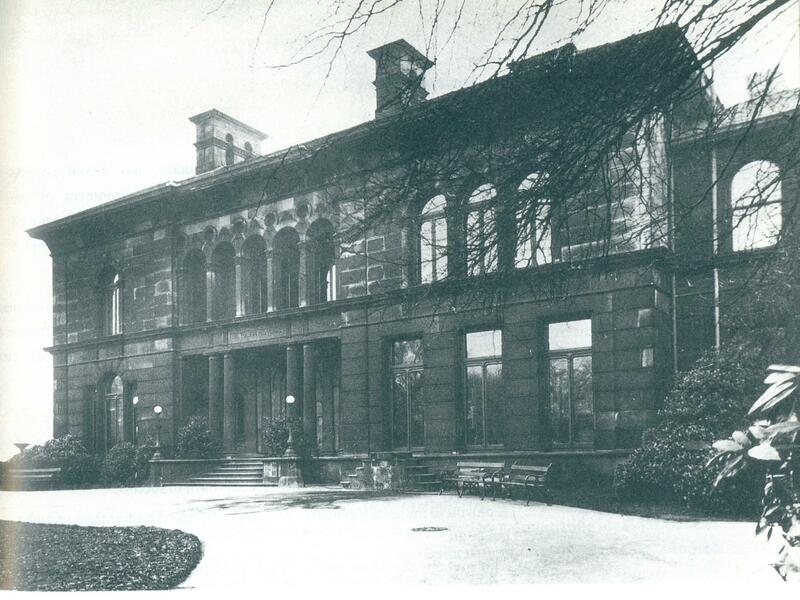 Emphasising his immense personal investment and interest in his work he reminded people that many exhibits had come from Beaumont Park Museum and, ever since his father’s ‘Mosley’s Museum’ of 1847, a suitable place for displaying the wealth of local specimens had been awaited. ‘Few persons have any idea what all this means. The days and sometimes weeks scouring the countryside, turning over stones, shaking boughs and bushes over inverted umbrellas, fishing in pools with nets, nights spent in woods with treacled trees and tramping home, perhaps twenty or thirty miles, in the early hours of the morning…’ Also he had spent over £20 on books and other things, ‘to enable me to do my work intelligently and as well as it can be done and that is why the work crowds round me.’ In his weakness he was visited by intimations of mortality, ‘The greatest pleasure of my life is my work and I pray for more life that I may finish the work I believe was given for me to do. But whether the end comes sooner or later there is one thing I can do – I can live for each day as it comes along and put my best into that day’s work with the Helper by my side’. The doctor was called in just before Christmas and Seth was still too ill to do his customary long New Years day ramble. This year he caught the tram to Waterloo and only walked to Gawthorpe Green. His time indoors in January was spent illustrating and sorting out his growing collection of pictures. He had been loaned W.F. Kirby’s valuable Introduction to Entomology with its 70 plates and 1,000 figures from which he copied pictures for postcards intended for sale. The best book on this subject, by Barrett, he hinted, at £28 was too expensive for most people. He reckoned that now his own collection of illustrations ran to a ‘One Copy Book’ which, if reproduced commercially would constitute a dozen volumes and over 4,000 plates at a cost £10,000. His plan to produce his own copies had been aborted when he ran out of paper, ‘at a time when paper was so dear’ and now his work for the Museum had taken all his attention. When the Museum was ready and opened he hoped to have time to make copies of his ‘One Copy Book’ for the Museum and the Public Library. Help in the form of paper, or transport in order to help him save time and extend his investigations would be especially welcome since now he found ‘ten or twelve miles there and the same back in one day is more than I must undertake in the future’. During the week he received offers of help including £10.5s in cash, which he put down not merely to his written appeal but to ‘thought telepathy’. Several offers followed to put him up overnight when out investigating, which he explained would have to be declined until after the Museum opening at Easter. He was still working on the insect collection and drew attention to the importance of Huddersfield for the study of melanism in moths, as one of the first places it had been observed. A good reference collection at the Museum was vital since ‘it is certain that future students of this phenomenon will turn to Huddersfield as the place of all places to seek an explanation’. He appealed to local collectors to share their specimens, or at least allow drawings to be made. Donations of other insects were still arriving both in the form of collections – Fred Ellis, of Swallow Street, gave 20 cases of butterflies – and newly caught individual specimens. Ben Morely of Skelmanthorpe, president of the South West Yorkshire Entomological Society ,and other members, donated insects for the Museum which they visited before their annual meeting in January 1922, held at the house of GT Porritt in Dalton. Seth appealed, not for the first or last time, to senders not to put live insects in matchboxes, or tobacco tins, since the chemicals killed them – instead ‘An incandescent mantle box is just the thing’. As his 74th birthday approached a friend advised him to take a month’s rest, but with the Museum opening looming, and a little behind schedule, it seems unlikely that he got it. Illness and natural ways to avoid it continued to be a preoccupation of his column over the following weeks, ‘premature death stalks from one end of the land to the other like a mighty giant mowing down the people like grass. And why? Because we have separated ourselves from Nature…’ His interest in the curative powers of Nature was also practical. In response to an inquiry from a woman herbalist about where to obtain comfrey, he went out himself to pick some and delivered it to her personally on Scholes Moor, travelling seven miles by tram and 16 miles on foot. After his birthday he also took regular long rambles including to Bilberry Clough and to Flockton Moor via Bretton Park – not many people’s idea of taking a rest ! On Saturday 27 May the Museum opening was attended by around 1,000 people, presided over by the mayor. Mr Leigh Tolson carried out the ceremony with a golden key announcing that Professor Collingwood had written to him congratulating him that the Museum was pursuing the right lines as a local collection. Councillor Robson, for the Museum Committee, and Dr Woodhead, thanked Mr Tolson for making it all possible. Seth, using his column to deliver his report of the event, emphasised his own family’s long, if humble, link with the Tolson family, which he had only fully realised himself since he came to work at the Museum. ‘Now the relationship is no longer of employer and employed’, he was working to make the Museum a ‘more scientific and educational institution’. 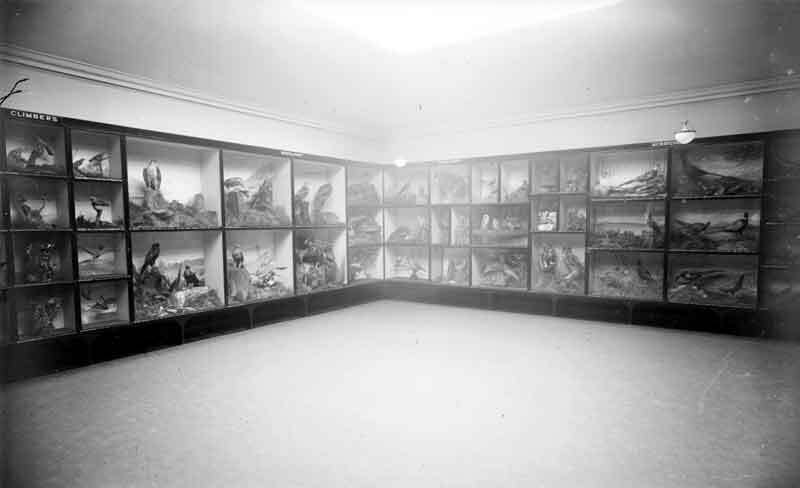 The Mosley theme in the bird room was illustrated by the exhibition of the only photo his father had ever sat for, (taken by the woollen manufacturer, naturalist and secularist, George Brook junior), along with the blue card advertising ‘Mosley’s Museum’ from 1847. As the best stuffer in the district, James Reid Mosley was connected with some of the star exhibits in the collection, especially ‘the nucleus’ provided by the Beaumont collection, with its many local birds. Mr Johnson Wilkinson had also donated his collection. There were 400 specimens in the room and only one, a young rook, had been deliberately killed for it. Nearly every bird had been re-stuffed and placed in ‘attitudes of action’, in uniform cases, with scenic backgrounds depicting a typical environment. Despite his obvious pride in this achievement Seth reiterated that he had originally wanted only paintings in order to ‘discourage wanton and foolish destruction of bird life, the life of our best friends.’ He was supported by Sir John Brooke but the Committee, who wanted ‘the real thing’, had over-ruled him. He also regretted that while the guide book for the Ancient Britons room had seen a steady sale, the bird room guide was not yet ready. Given his enthusiasm for writing and publication we can read between his lines that he had not been given the responsibility to deliver this. With the opening out of the way, we can almost feel his sense of relief and exultation in the following week’s column entitled ‘Out Of Doors’, which describes a trip in ‘gorgeous weather’ to see ‘The Old Scouter’ at Gatehead, a motor ride to Dunford Bridge to gather moss and a visit to Denby Dale to see a plantation of conifers brought from all over the world by the late Walter Norton. The following week he got a lift on a Corporation coal wagon to Flockton, en route for an excursion to Bretton and Bentley Grange. Chamomile . 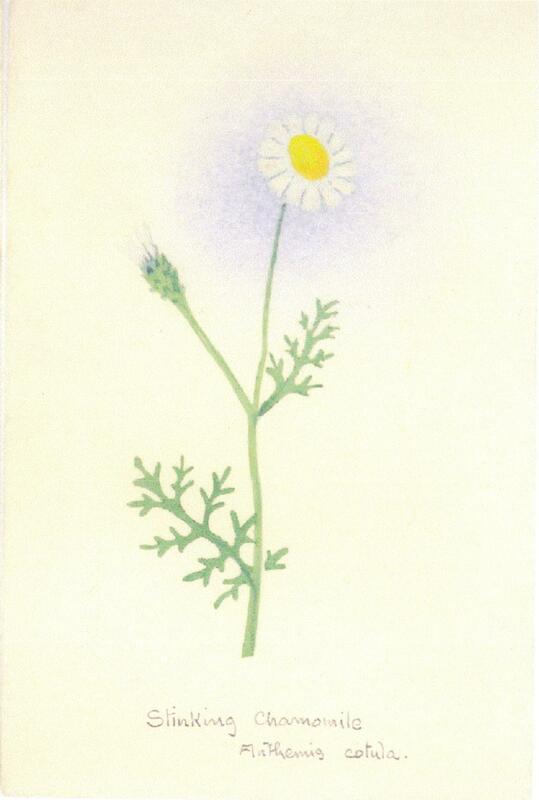 One of Seth’s herb postcards. He also travelled on official business, attending the Museum Association conference at Leicester and visiting the local museum. There was a particularly interesting paper on the fading of specimens, which he thought substantiated his own idea that it was better to display paintings and keep specimens in drawers for serious students. He was managing to use his artwork for the museum in another way, sending out 59 dozen packs of post cards of medicinal plants, advertising Ravensknowle’s details, for sale at a herb farm at Chalfont St Peter. His own interest in herbalism was reinforced by a story he heard in Leicester of a consumptive cured by Great Mullein and the strange coincidence that there was a consumptive in the family of a man who asked him round to identify a ‘weed’ in his garden which turned out to be the same plant. He also recounted how a farmer at Emley had saved his sickly young pigs by feeding them boiled Comfrey. Some of his advice appears a little dangerous today. Among the successes he claimed was a girl cured of ‘brain fever’ by elderflower and peppermint, and a blood-poisoned finger healed by a Comfrey poultice. Specimens were still being brought regularly to the Museum including a live hedgehog from Flockton Mill, which was liberated in the park, and a gannet which was caught alive after flying into telephone wires at Hall Ing, Honley. Since the museum did not have a local specimen, (although it was at least the fourth know to have occurred in the area – one was acquired at Emley Moor, one Slaithwaite in 1854, another at Holme in 1909), Seth asked Franklin Hallas, who reported it, to bring it in. According to Raymond Hallas, who told the present author he had been the actual captor, they were advised on the best way to kill it without damaging the specimen . Whether it was injured, or would have died anyway without proper feeding, Seth obviously felt justified in sacrificing it for the collection. It was now the season for collecting fungi and Seth had a strong urge to visit Honley where he found a fungus whose only previous Yorkshire location was near Scarborough. Smith Carter of Healy House also found some species, including Fly Agaric, rare in the district. His column for the first two Saturdays of September described mushrooms, toadstools and tree fungi and he was inspired to add 146 coloured drawings of fungi to his reference collection. An exhibition of his 1700 of his coloured figures of ‘Varieties of British Lepidoptera’ was also exhibited at the British Association meeting at Hull in September. The hand coloured copies that he had produced and sent out in parts to make up the book of the same name in the 1890s had then cost £3. The exhibition was now insured for £200. He offered to present the collection to Ravensknowle, but we do not know on what terms. There was still some friction between him and the Museum management since he still felt the lack of facilities necessary to carry on the work he wanted to do. Particularly there was nowhere suitable to hatch larvae and pupae for his insect studies. He emphasised the economic importance of this research citing the reduction of the value of wood harvested at Storthes Hall by £400 due to burrowing insects. While entomologists in the US had made the importance of their work felt since the war. ‘What have English entomologists been doing ? Making collections !’ A plot of land was also required at Ravensknowle where entomological and botanical research could be carried on. He closed the year on a note of optimism, ‘I should like to make 1923 the Jubilee of my life’. There was certainly less pressure on Seth that year, allowing him to pursue other activities, but there were still niggling differences about the running of the Museum which he occasionally gave vent to. His hope of making Ravensknowle into a wildlife park was one of things which had not been realised. Many of the birds had deserted it, including the mistle thrushes which he had been delighted to watch as they nested from his study window. If this was to continue then parks would loose on of ‘their most pleasant attractions’ although there was no reason that they should be ‘almost destitute of bird life. He advocated that by-laws should be introduced to protect birds and nests in local parks and that feeding of them should be encouraged. A few months later he condemned the existing Acts which were supposed to protect birds as ‘almost a dead letter’ and he hoped Lord Grey, a famous bird lover, would be able to frame a suitable bill, ‘Something very definite needs to be done and done soon to save the farmer’s best friends and the crops.’ For his role in popularising this concern he had been made an honorary member of the RSPB. ‘Whoever has perpetrated this diabolical act of cruelty deserves to be tied to a cart-tail and flogged through the town. Could anyone have believed in a country professing to be “Christian” and “educated” there could have been found someone so utterly depraved ! Surely the proper place for this thoughtless individual is Storthes Hall’. We can imagine his disappointment therefore when later that year he was presented with a stuffed long-eared owl by Brockholes Wesleyan Guild, which had been shot at Bradley – probably one of a brood he knew was living a Fixby. It must have shaken his confidence that the real message was getting through even to those who considered themselves admirers. In May he announced that since the Museum was now in fine order he was to resume some of his missionary work and would lead the Whit Saturday ramble to Cawthorne. It seems that some comment was made about this because he was goaded to point out in his column that he had done this for the last 30 years without payment and it was about time it was done by the Museum. Also he criticised the lack of advertising of the Museum in the form of picture postcards and leaflets on various objects, which had proved successful at Beaumont Park, ‘as I first suggested’. He continued promoting his own post cards and received £1 for 100 he had sent out, which he announced he was to put towards buying the fifth volume of a catalogue of birds eggs issued by the British Museum, which cost £2.7s.6d. Individuals continued to donate specimens to the Museum or request information from him. He was pleased when a letter simply addressed to , ‘The Naturalist who sells works on fungi and other natural subjects, Huddersfield, Yorkshire, England’, – but less amused when he got specimens equally vaguely described as ‘found at the edge of a corn field’ or ‘at the mill’. Over the following weeks, until February 23, the column ran a series of factual accounts of diatoms, bacteria, ‘witch brooms’, cankers, tree rots and various forms of fungi. Whether or not this criticism had come from the Museum there was certainly friction over other matters. Replying in his ‘Museum Notes’ of 15 December to schools inquiring if they could borrow teaching objects, he irritably explained that some one else was in charge of this now and ‘too many cooks spoil the broth’. To another correspondent he denied any responsibility for the arrangement of the mineral collection and supposed, when the display was completed, that explanations of origins of minerals would be provided. Such thinly veiled public criticism of the efficiency of the Museum was not calculated to smooth over any differences which did exist. If the collection was to be complete, he emphasised, it would depend on his personal influence and reputation, since his present confined role at the Museum prevented him from approaching people in his capacity as curator. He made clear it was only existing specimens he was interested in and didn’t want any more rare birds shooting. The request for local birds was repeated in a note to his column on 1 March, which also carried a further complaint about the limitations placed by his working conditions entitled ‘Museum – Research and Advisory Work’. He reminded readers that he had collaborated with the noted agricultural entomologist Miss Ormerod on the problem of insects harmful to crops from the 1870s until her death and that advisory work for gardeners and farmers had continued at the Beaumont Park and Technical College Museums. At the latter he had worked, ‘under considerable disadvantages. There was no available ground for experimental work and it had to be carried on, as best I could, by myself, privately, without official sanction.’ There were still no facilities at Ravensknowle, despite him continuing the work and receiving many letters to prove its importance. To be done properly it needed to be on a ‘systematic and official basis’ and advertised to gardeners, farmers, shopkeepers etc as a service based on the ‘benefit of half a century of experience and free of charge’. He was also able to consult his son, Frederick Ormerod, head of economic entomology at University College Reading, and call on other experts for information. Over the following weeks he pointed out the lack of experimental facilities including a small breeding house for insects and, after foreign ones which had survived processing at a Honley dye-works were brought to him, somewhere to germinate seeds,. The appeal for birds had some results. A grebe shot at Gunthwaite many years before was donated by a Miss Wainwright in March and in May he tracked down an Egyptian Goose shot on Slaithwaite Reservoir in 1895 and stuffed by John Gough. Mr Spencer of Elland, the man who had shot it, brought it in to the museum in exchange for a portrait of it by Seth, which he thought ‘better than the bird – and you can have owt else I can get.’. He also donated a black tern obtained at Elland. Seth encouraged other donors by pointing out that if the other specimens were received it would make it the most complete local bird collection in the country. However, he still had an ambivalent attitude to the proposed new bird room. He was striving to complete his reference collection of illustrated birds. By March he had over 6,000 pictures of British birds in various states of plumage – an average of 15 illustrations for each of the 400. He intended to remount them ‘in the hope that it may eventually be admitted for permanency in the museum’. (He also had an average of ten pictures of 2,000 butterfly and moth species, many of them cut from books, which he was sorting and mounting). Together with his son Charles he was employing his artistic abilities fitting up the new cases for the water birds, ‘which lend themselves to scenic effect’. He repeated the story of his original suggestion to exhibit only pictures and the official response that the public wanted ‘the real thing’. A Long Tailed Duck, shot at the same location around 1920, from Mr Sedgewick of Ramsden (in exchange for a picture of the specimen); a Manx Shearwater, shot Sheard’s Dam, Gawthorpe, from T. Bedford of Thongsbridge; a Puffin, caught exhausted on Honley Moor, c.1908, from Arthur Russel at Netherthong. Despite the restrictions he had complained about on work outside the Museum, Seth was increasingly getting out and about. His mobility was helped by the extending bus service. He was given a free pass by the County Motor Bus co., which ran in the Flockton direction and he also used ‘the blue bus’ which ran to Ingbirchworth and the Barnsley Bus ‘commended by its non-smoking conductors’ to Cawthorne and Cannon Hall, areas where he was extending his rambles. Seth was very particular who accompanied him in the countryside, ‘I want it to be clearly understood that I have neither the time nor the inclination to go with picnic parties who go merely for a day’s frolic and pleasure.’ He wanted only ‘kindred spirits’ who walked slowly so as not to miss anything and who didn’t rush along constantly asking, ‘How far is it?’, ‘What time shall we be back?’ Anything that got people into the country was good and essential for health, even picnicking, but he thought people should make sketches, take photos or collect pressed flowers, which would make it more enjoyable and memorable. He warned against leaving litter, lighting fires or damaging the environment, ‘It grieves me very much to see girls and women coming home with armfuls of drooping, withering, flowers and scattering them all along the road…’ He also condemned people who dug up plants, saying one beauty spot near the town had been completely destroyed by fern hunters and around 30-40 species had been lost from the district, partly by people uprooting flowers like primroses for sale. Travelling was also made easier by offers of transport from friends. In July 1923 Seth had taken his ‘invalid partner’ on a motor ride around Shelley and Gunthwaite and Mr Ainley of Berry Brow had taken him in his side car up to Wessenden to look at the cloudberry. In 1924 Mr Frobisher had driven him to Bakewell to see a collection of Lepidoptera offered to the museum. 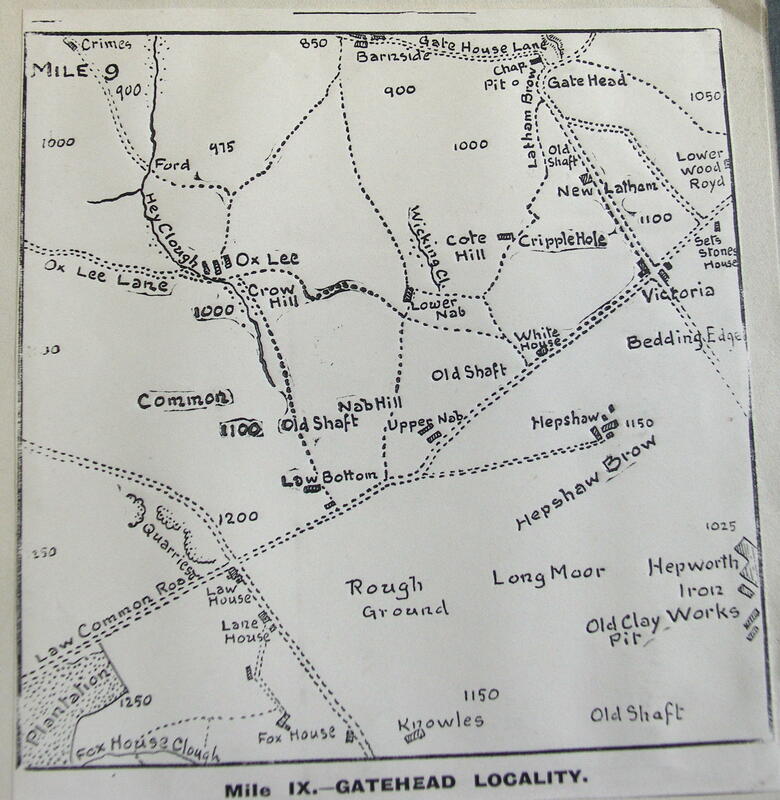 In June he referred to a common request from readers for local information, ‘When are you going to give us another mile ?’ By August he was looking over the Carrhead mile between Denby Dale and Penistone. In October he described, Denby Dale, Gunthwaite, Shuts Hill, Pool Hill and Cannon Hall. Not everyone was convinced of the scientific value of the square mile investigations, which mainly consisted of listing very species which was seen during the course of a visit, with some casual observations on geology, topography, place names and the economic activities of the local population thrown in. Ben Morely of Skelmanthorpe described it as ‘an outing, that’s all.’ while Seth explained that its aim was to compile a full record of the district not just from his records but because it induced other people to go over the same ground and make their own observations. Ben however passed on a list of 347 butterflies and moths seen in Deffer Wood, which Seth described as ‘a valuable addition to my work’. He also showed Seth some foreign butterflies mounted in a new way similar to one Seth said he had tried to introduce at the Technical College Museum. It was estimated that the present method was costing the museum about £1 per drawer, and the exhibition cabinets totalled 40 drawers. The Clerk forwarded the letter to John H Robson, chairman of the Ravensknowle Committee, to deal with, who obviously thought it better to ignore it. On 29 October, Seth wrote to Robson asking why there had been no response and added more fuel to the flames. He was reminded that any ‘suggestions’ he might have should be put to Dr Woodhead, or via Charles who was clerk to the Committee, or directly to the Committee itself. ‘In the meantime , I must ask you, please, to adhere to the arrangements which we entered into in our conversation.’ In the covering letter sent to Dr Woodhead enclosing the correspondence, Robson revealed his true opinion of Seth, ‘I was tempted to put it a good deal more strongly, but, after all, one is dealing with an old man in his dotage, and with this in mind I have replied as you will see.’ If this was how they viewed their curator, then Seth’s complaint that his role was not being taken seriously, or his experience valued, seems quite justified. In effect he was being eased out of his post before. This exchange of letters ended in stalemate and both parties probably looked forward to his official retirement, due the following year..
Seth was not reticent about his moods. At the turn of the year he wrote, ‘For the last two or three weeks I have not had my usual amount of exercise and if the reader detects a taint of moroseness in these notes it must be put down to that cause…’ He was also pondering the future and ‘it became evident that I should either have some assistance in my work or give it up.’ Fortunately he found ‘a useful assistant’ in Miss Thomas, (now of 17 Longley Road), who he began to train to take over some of his unofficial work. Perhaps having a female companion reminded him of his earlier close collaboration with Miss Ormerod. Miss Thomas was put in charge of organising rambles under the auspices of the Naturalist Christian Movement, contacting subscribers and sending out syllabuses. She also helped him accumulate his picture collection, copying and cutting illustrations from books, a task which his daughter had fulfilled until she left home. The bird drawings were mounted on 11 by 81/4 inch sheets which now numbered 1,542. He still entertained hopes of exhibiting them at Ravensknowle, but the space he wanted was filled up, so he offered to show them to any interested persons between seven and nine on Thursday evenings. ‘I believe my collection of drawings of varieties of birds, eggs, butterflies and moths is the most complete in the world’ he announced proudly, ‘but as I have said above, it is far from complete’. He still needed to visit collections such as the G.H.Booth bird collection in Burnley Museum and the Oxford Museum butterfly collection but he had been advised that at his age he should not travel alone – perhaps an explanation of why Miss Thomas was now accompanying him so often. Mr Frobisher recorded in his diary his first meeting with Seth’s friend on 16 March 1925 at the latter’s 77th birthday party. ‘About 14 of us there, a few old friends we had met before and two Miss Thomas’ of whom we had heard but not met. I came to Butchers’ Meeting at 7.30 at P. Scrimshaw’s and then back to S. L. Moseley’s, some of guests gone and we were last to leave about 10 and got home about 10.15’. At Easter Seth took Miss Thomas to Grassington for a few days and in July to Kettlewell and Malham. In autumn they were off to Wharfedale again, this time accompanied by Miss Thomas’s sister. One day he spent indoors drawing autumn leaves while the Misses Thomas went out sketching the landscape. At Kettlewell he put a notice on the board of the Wesleyan Chapel announcing an evening lecture, ‘Birds our Angel Friends on Earth’ and ‘a large number of our post cards’ were distributed. ‘Had a letter in the morning from Mrs. S. L. Moseley and did as it said, burnt it. Strange to say Ada and I were going to see her after tea when we met Mr. S. L. Moseley on Honley Bridge and he came back with Ada and I took Gladys to her music lesson and George to bottom of Scar. SLM suggested we did a bit of gardening and then told us his reason for coming, it was because his wife was upset at his going with Miss Thomas to Grassington’. Despite this Seth carried on the association with Frobisher caught up in the midst of growing acrimony. On 22 August he recorded; ‘Mr. S. L. Moseley and Miss Thomas called about 7’ and then, only six days later, ‘I took Mrs. S. L. Moseley … back to Ravensknowle about 10. She is quite vexed at Mr. SLM setting out for Kettlewell with Miss Thomas’. He had now been producing his Examiner column almost every week since 1914, taking up an average of nine sheets of paper a week but, constantly frugal, he had never bought any jotting paper, instead writing on anything with a white side. He arranged his ideas by putting them on slips of paper which were placed in envelopes bearing the subject title in red ink. The Examiner acknowledged his prodigious contribution by including him in a ‘Literary Links with Huddersfield’ series for 28 February 1925, which described him as a preacher and a teacher. Summarising his artistic and written achievements since the 1870s it pointed out that he had published and printed much of his output himself, or helped by Charles, often in limited editions. There were only ten complete copies of his ‘Butterflies of Europe’, which comprised three volumes, originally issued in 72 parts, known to exist and not a single copy in Huddersfield. It was fetching 15 guineas at auction. Charles’ own works, on ‘The Oak’ and a new edition of ‘The Natural History of Selbourne’ were also mentioned. His column had spread his reputation across the globe. He was always pleased when he was acknowledged by strangers or interest was expressed in his column. A letter from a female follower in America described him as a ‘millionaire’ enriched by the love he spread and received was regarded as special tribute. He was told of a man from Los Angeles who had the Examiner sent out so he could follow Seth’s articles. 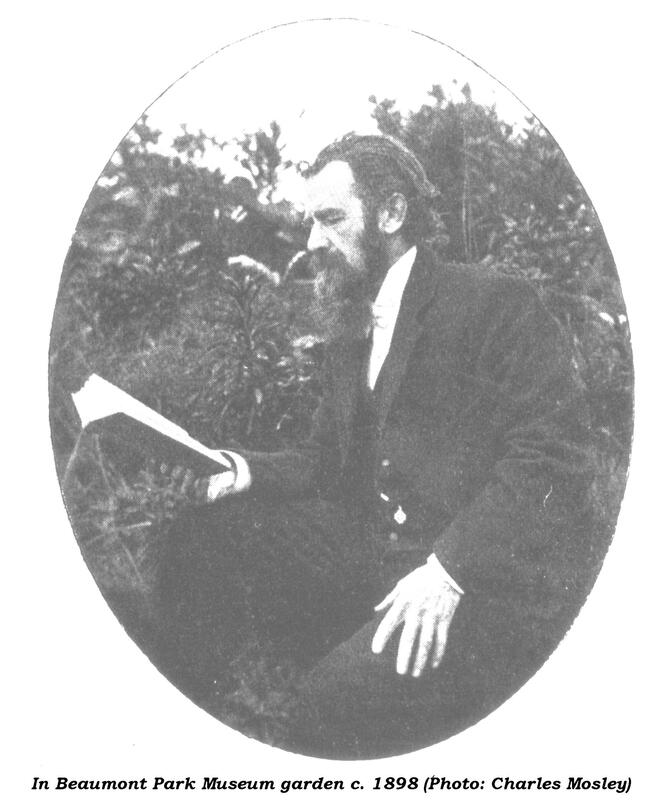 While in July 1924 he had been visited at Ravensknowle by a lady and gentleman from Pretoria, ‘anxious to see the brewer and brewery where “Nature Around Huddersfield” is fermented and runs out to the ends of the earth.’ He had readers and correspondents, often former Huddersfield people, from British Columbia to New Zealand. The regret of his followers at his resignation was expressed in a letter to the Examiner from J.B.Farrand of Fartown. Entitled ‘Bishop of the Birds’, it referred to his widespread fame and the distinction he brought to the town, proposing that a fund be set up to help him continue his work for the community, with the support of those ‘who have profited and continue to profit by Mr Mosley’s findings from the book of Nature’. The rambling season ended that month with a well attended trip to Deerhill. The ‘Old Scout’ proposed continuing rambles over the winter and Seth thought they should be replaced by a fortnightly ‘at home’. Miss Thomas was to receive the suggestions from members. As the weather continued unseasonally fine he wished the rambles had continued, but settled down to work on his bird pictures – now running to 25 volumes. In his column he also returned to his concern of bird protection, recounting the story of how ‘an educated gentleman’ on a shoot had deliberately stamped on a nesting nightjar and her chicks. Shooting, trapping, nest robbing had exterminated many species locally. 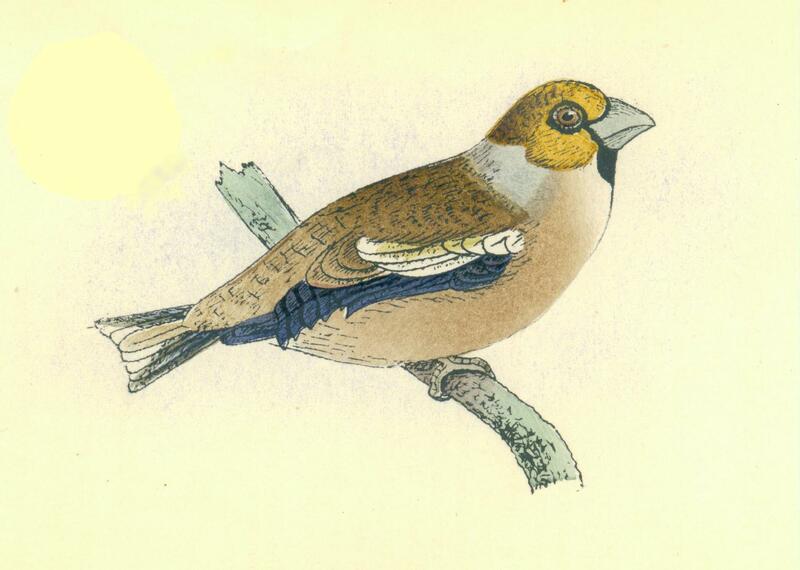 Earlier in the year he had contrasted the present ‘dearth of bird life’ around Huddersfield with when he was a boy and ‘… greenfinches, yellow hammers, linnets, yellow wagtails, wood wrens, chiff chaffs, warblers of various sorts, etc were quite common. In summer the woods rang with their voices…’ and proposed that the Huddersfield, Woodsome, Storthes Hall, Bretton and Cannon Hall estates should be amalgamated into a bird sanctuary. I took Elsie and Ada down in afternoon and then on to Miss Thomas’s and took Ada and her to Kaye Lane, Almondbury, and I went on to Shepley and corrected error made yesterday. Got back to Kaye Lane 3.40 but Ada and Miss Thomas did not turn up until after 5 and when we got to “Bradda” had to wait of tea getting ready and it was nearly 6.30 before I go to shop, Elsie waiting to go up town. Had a busy time in shop. After 8 I ran car up to Ravensknowle and after a chat and look at new bird room, we took Miss Thomas home and called at Hubert’s for Elsie and got home before 10. Elsie and I got pies made and into oven and then had a bit of lunch and at 1.55 met S. L. Moseley and Miss Thomas and took them to Leeds Art Gallery, after I had called at Avery’s and ordered dishes etc. It was to look at a collection of Turner’s pictures, but felt rather disappointed. We got back into Huddersfield about 6 after a nice run via Brighouse. It may be significant that there are no references to Seth throughout November and possibly Frobisher had decided to distance himself, least it be seen as condoning the relationship. It is not until 5 December, when he attended the official opening of the new bird room that Seth gets a mention. The new Bird Room contained two hundred species in a space 24 by 30 feet, with a top window light to provide even illumination designed by the borough architect, Mr Sutcliffe. The arrangement was attributed to Charles Mosley by the Examiner correspondent, whose attention was caught by the Fixby eagle owl and the magpies stealing eggs. The hundred or so guests, including Professor Priestly of the Yorkshire Naturalists Union, were welcomed by the chair of the museum committee, Councillor Robson, who introduced Professor Garstang of Leeds University. He paid tribute to Seth, Charles and Dr Woodhead and commented on the artistic background to the cases. Seth described the work on the collection, recounting the amusing anecdote of how he had obtained the Fixby owl from the Slip Inn. Whether he reiterated his theme on preferring pictures to stuffed birds on this occasion is not recorded. His sense of achievement was tempered by a feeling of anti-climax and end of year blues since, in his column in the same edition of the paper headed, ‘Meditative’, he links a reaffirmation of the joy inherent in Nature and the direction of his life with some pessimism about his ability to achieve it. Hope came through living according to natural laws and ‘A natural law broken or unused is an offence against Nature…’. An understanding of these laws could only be achieved if the whole of Nature was studied in the same detail, and as systematically, as the weather was recorded by the meteorological station at Ravensknowle and the thousands like it across the country. He was daunted by his own plans to work towards that end and reveals the fundamental reason why he found himself at odds with bureaucratic authority. He reminded people that Ravensknowle had not just been built in the last five years, as reported in the Examiner account of the bird room opening, but that it was the culmination of the efforts of previous generations. The basis of the bird collection, he reiterated, was that built up by Alfred Beaumont and purchased by Major, Graham, Sam Learoyd and C.P.Hobkirk as ‘the nucleus for a museum in Huddersfield’. Other specimens had come from the collections of Tom Shaw and Joseph Whitwam, both of Luck Lane. He sketched the lives of the local pioneer naturalists who had so influenced his own – among them the Rev. Job Johnson of Denby, William Eddison of Huddersfield, Peter Inchbald of Storthes Hall, James Varley of Almondbury, and, of course, his own father. ‘With the exception of Mr Porritt,’ he added with a note of finality,‘ all the above have “joined the majority”’. It was perhaps then with a sense of his own mortality that he began to sort out his many volumes of notes, ‘My retirement from active service at Ravensknowle will give me the opportunity of classifying them and putting them into systematic order, and to make them in some form available to others…’ He was also planning to devote more time to his Christian Nature Study Mission rambles and extend the square miles investigations. His career as a public servant may have ended, but he had no intentions of retiring from service to the public, nor trying to awaken their awareness of the beauties of Nature. HEW 20 Dec 1919. This is entitled ‘The New Museum Room No.4’. Whether there was a 1 to 3 we don’t know since the supplements to the paper which carried his column are missing. HEW 25 Oct 1919- need to stop bird catching in the name of science. Minutes of Hudderfield Corporation, Ravensknowle sub-committee (Huddersfield Local Studies Library). Stuart Davies ‘The Making of a Municipal Museum- Huddersfield and its Naturalists’, in Hilary Haigh, A Most Handsome Town.p.698). I am indebted to this essay for stimulating me to further research on this topic. Ben Morely succeeded Seth’s son Charles as curator at Ravensknowle in 1930. He died following a seizure at the Museum only two years later aged 60..
Interview with Mr Raymond Hallas of Church St, Honley c.1982. The extracts from Fretchfield Frobishers diaries have kindly been provided by his descendant Mr Neville Sheard.See also The Life and Times of Fretchfield Frobisher , Neville Sheard & Jean Nursten (self-published). The Naturalists Journal Vol IV, 1895. p.40 note – “Egyptian Goose near Huddersfield” (shot at Slaithwaite). HEW 10 May; 14 Jun 1924; 14 Nov 1925. HEW 2 Aug 1924; 9 Aug (mosses); 16 Aug (seaweed); Sep 13. A wryneck shot at Oxspring c. 1835 was donated by J.W.Dransfield, nephew of the man who shot it, author of History of Penistone in January 1925. Seth spotted in a case when he was visiting for tea. HEW 24 Jan 1925.HEW 14 Jul;21 Jul 1923.My emphasis on the ‘our’. I found this very interesting, particularly the way in which Seth integrated his work in natural history with his interests in mysticism. I gave a talk a while ago at the Tolson museum about Sir Arthur Conan Doyle and the Cottingley fairies case, though I didn’t know at the time that there was such a direct connection. I wonder, would you mind identifying the date of the column in which Seth mentions his meeting with Elsie Wright? Thanks for your inquiry. The reference is in Seth’s column in the Examiner of 24 Sept 1921. I have a chapter specifically on his religious and mystical beliefs but it is not completed yet. I got sidetracked by a study of Nature mysticism in his lifetime, Jeffries, ‘Michael Fairless’ etc.